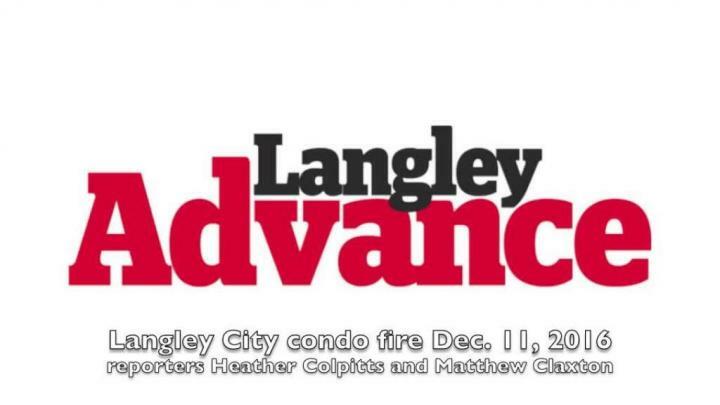 Community rallying to help hundreds displaced in a condo fire off Fraser Highway late Sunday morning in downtown Langley City. Dec. 11, 2016 5:00 a.m.
UPDATE: The City held a meeting with the evacuees Sunday night at the reception centre in Douglas Recreation Centre. Those who did not attend can visit the centre today before 4:30 for more information, and another information session for evacuees only has been scheduled for noon today (Monday, Dec. 12). 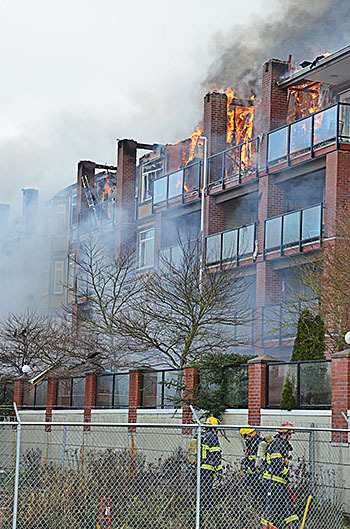 A fire has driven numerous residents out of Paddington Station condo complex in downtown Langley City. The fire spread through the upper floor of the four-storey apartment complex, gutting numerous units. According to residents, the fire started just after 10 a.m. on the morning of Sunday, Dec. 11. Vince Stewart and his daughter Ellen live on the second floor of the building. They said the fire seems to have started on the fourth, top floor of the building near the southwest corner. “We were getting our fire systems checked tomorrow,” Ellen said. At first, she didn’t think it was a real fire when the alarms started going off. She thought they had just started testing the alarms early. But when they smelled a powerful, burning rubber smell, they grabbed what they could and ran outside. 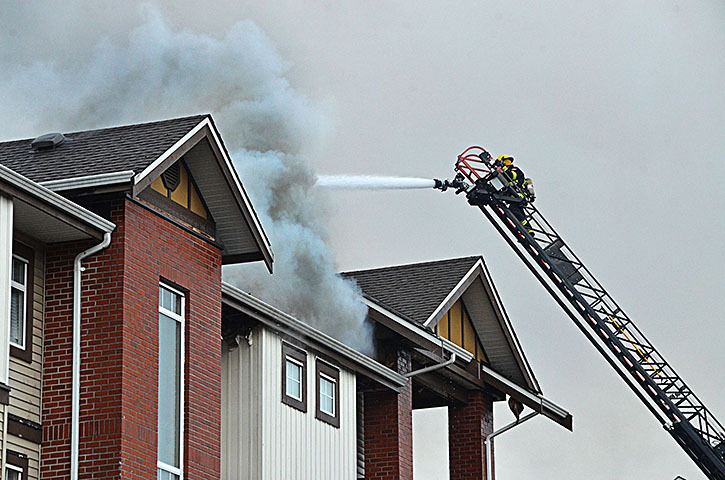 Langley City firefighters were backed up by Langley Township and City of Surrey fire crews as they battled the blaze. Paddington Station was built in 2009 and consists of 18 townhouses, and two condo buildings, one with 86 units and another with 98. Residents of the building were ushered onto buses, and plans were being made to take them to a nearby community centre to keep them warm for now, said City Mayor Ted Schaffer. The City’s Emergency Preparedness Program set up buses at the scene while others set up a reception centre at Douglas Recreation Centre. Residents were asked to go to Douglas Centre to sign in with the program. The residents will receive food and drink and temporary assistance. If they don’t have a place to sleep tonight, the program will help them, explained Ginger Sherlock, who heads the local emergency program. Her volunteers were on site to help residents but they won’t know how many people need help until they get an update from the incident commander and people show up at the reception centre. Even those staying with family or friends should contact the reception centre so emergency crews know they are out and safe. Sherlock said residents can also just go to the centre for some emotional support. It allows the people to get the help they need. “In Canada we’ve always said bring your pets because we understand pets are family,” Sherlock said. People were showing up at the scene with coats, blankets, and more. Starbucks across the street took over warm drinks. Langley Superstore manager Joe Viana went to the Douglas Recreation Centre with a pickup truck loaded with water and asked what was needed, getting on his phone to arrange for sandwiches, fruit and juice for the displaced families. People can keep track at Langley Emergency Program on Facebook and on Twitter @langleyPrepared. In the coming hours and days, the Langley Advance will help let the community know what supplies and support are needed. The Gateway of Hope announced on its Twitter feed that it would be accepting donations for the fire victims. “We’ve had a wonderful and overwhelming response so if people could wait today and call us tomorrow (office is open at 8am, 604-514-7375) that way we can redistribute and make room for more donations.” the shelter told the Advance. Gateway will accept clothing and food, or money to put towards those items. Watch for updates, as more information becomes available. The Langley RCMP has been assisted by Surrey RCMP,” said Langley RCMP Cpl. Holly Largy. Emergency workers are checking to ensure all residents are accounted for and roads in the area remain closed, she added.